Hundreds of women are incarcerated across the world for having suffered miscarriages, stillbirths, and other obstetrical complications without medical attention. Many of them live in El Salvador, where they usually live in poverty and marginalisation. Some have been sentenced to decades behind bars. Central America is notorious for anti-abortion punishment, with El Salvador being one of the countries most actively reinforcing the criminalisation of abortion. Central America Women’s Network’s (CAWN) partner in El Salvador, the Asociación Ciudadana (Group for the Decriminalization of Therapeutic Abortion) has launched the “We are all the 17” campaign. This campaign is building global backing to demand pardons for 17 women, all from deprived backgrounds, who have been imprisoned for the “crime” of pregnancy complications. 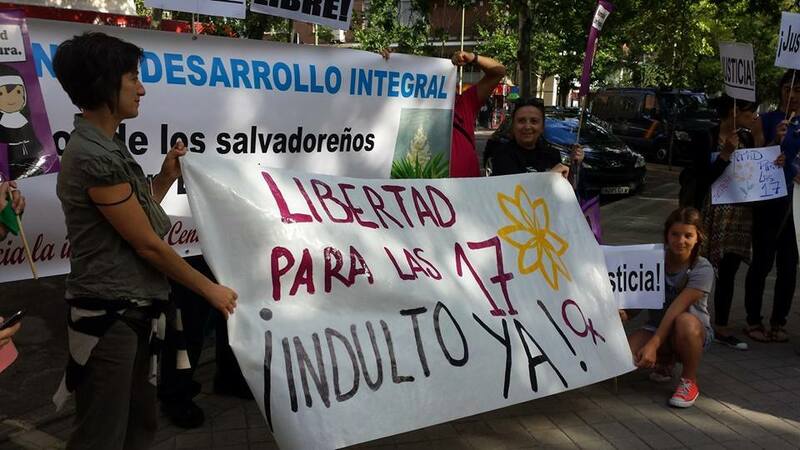 The “We are all the 17” campaign appeals for solidarity from people who share the women’s bid to regain their freedom, return to their families and rebuild their lives. Between 2000 and 2011, 129 women were prosecuted for abortion or aggravated homicide (related to the pregnancy product). This figure however represents a small percentage of the total of women who undergo an unsafe abortion in El Salvador, estimated to be 35,088.60 per year. The majority are poor and young, with 84,5% of women accused under the draconian anti-abortion law under 30 years old. Only a fourth of the prosecuted women attended high school or university, and nearly 80% have no income or are on below minimum wage income. Most of the women experienced obstetric problems during their pregnancies and gave birth without any medical assistance. The women were bleeding when they managed to reach a hospital. But when they asked for help, rather than gain support, the women were reported and prosecuted for aggravated murder. A paper, ‘From Hospital to Jail’, to be launched by CAWN and the Reproductive Health Matters Journal explains that another effect of this restrictive legislation is the suicide rate of pregnant women which, according to the Maternal Death Surveillance System of the Ministry of Health from El Salvador, represented the third cause of maternal deaths in 2011. The paper establishes that the lack of alternatives in the case of an unwanted pregnancy is leading many women to commit suicide. Under current Salvadoran law, anyone who performs an abortion with the woman’s consent, or a woman who self-induces or consents to someone else inducing her abortion, can be imprisoned. Healthcare professionals are obliged to maintain patient confidentiality, but also to report any crimes to the police, including that of abortion.